Researchers from the Zoologische Staatssammlung visited Indonesia in an effort to establish collaborative projects with universities in Sumatra and Java, and in the near future, the project collaboration will be expanded more broadly with the Indonesian Institute of Sciences (LIPI). 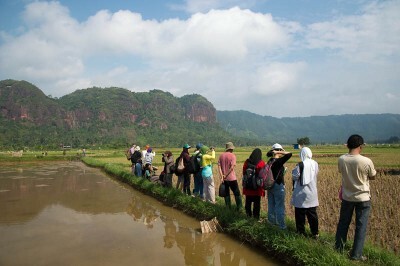 Collecting insects in Harau Valley, West Sumatra. During two weeks each at the Andalas University in Padang (West Sumatra) and Brawijaya University in Malang (East Java), Stefan and Olga Schmidt, Michael Balke, and PhD student Emmanuel Toussaint conducted courses to implement the module “DNA Barcoding of Arthropods” as part of the “Indonesian-German Network – Training of Trainers and Research Cooperation” (IGN-TTRC). A snack after collecting in Harau Valley. 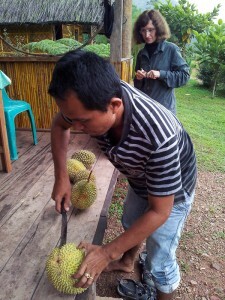 The taste of Durian – a mixture of rotten meat and vanilla – is not everybody’s cup of tea. IGN-TTRC is a consortium to improve teaching, training and research collaborations within Indonesia and between Indonesia and Germany, funded by the German Academic Exchange Service (DAAD). The objective of the program is to give an overview of the role of molecular biology methods in biodiversity research. Topics covered in the lectures include general entomology and molecular systematics, but also practical exercises in the field (collecting aquatic insects, Hymenoptera, and Lepidoptera), insect preparation, and molecular work including DNA extraction, PCR, sequencing, sequence analysis, species identification using the Barcode of Life Database (Bold), and using DNA barcoding for MBA (molecular biodiversity assessment). The participants of the courses came from over a dozen different universities across Indonesia, from Sumatra, Java, Kalimantan, and Sulawesi. Course subjects will be used to develop a joint curriculum leading to joint MSc programs and to establish conditions to facilitate the acceptance of Indonesian students into MSc and PhD programs at German Universities. Besides the training component of the courses, the aim of IGN-TTRC is to establish research cooperations between Indonesian and German institutions with joint projects and exchange of students. Who will be the first to jump into the rice paddy for collecting water beetles? Before the barcode there is lab work. The study objects for the courses were selected according to the research areas of the German trainers and included primarily aquatic insects , microhymenoptera, and geometrid moths. Collecting methods were as diverse as the insects of interest and included sweep netting, yellow pan traps, kitchen strainers for aquatic insects, and collecting at a light sheet at night. Indonesia’s biodiversity is unique in the world. Indonesia is a country of mega-diversity, rivalled only by Brazil, Colombia, and Zaire. The 17.000 islands that comprise Indonesia occupy only 1.3% of the world’s land mass, but the country is home of about 12% of the mammals and 17% of the birds of the world. Estimates of the species richness of insects are difficult, but it is probably safe to assume that in little known groups like microhymenoptera, only a tiny fraction of the species have been discovered. Tropical rainforest in West Sumatra, home of a myriad of new species awaiting discovery. This entry was posted in DNA barcoding, Entomology, Indonesia and tagged Indonesia on 6. August 2012 by Stefan Schmidt. Insektenforscher der ZSM sind derzeit in Indonesien unterwegs, und zwar als Trainer in Sachen Biodiversitätsforschung an den Universitäten in Padang (West Sumatra) und Malang (Ost Java). Der Aufenthalt wird vom DAAD gefördert. Dabei werden indonesische Universitätsdozenten in Fragen rund ums DNA Barcoding und klassischer Entomologie unterrichtet – eine Woche lang. In einer zweiten Woche geben sie ihr Wissen dann jeweils an eine Gruppe von Studenten weiter. Aus diesem Projekt sind bereits Kooperationen zwischen der ZSM und indonesischen Partnern erwachsen, der erste Gegenbesuch ist bereits im September 2012 geplant! 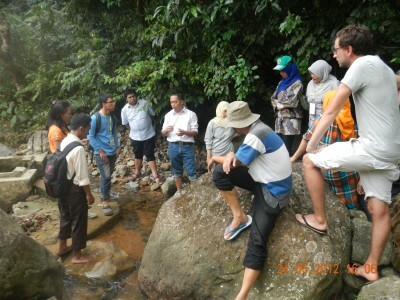 Dr Nia Kurniawan (UB Malang) gibt Studenten eine Einführung in Methoden der aquatischen Entomologie, ZSM Gastforscher Emmanuel Toussaint lauscht gespannt. This entry was posted in Indonesia, ZSM on 7. July 2012 by Stefan Schmidt.